Evaluating corn roots for rootworm feeding has several benefits in continuous corn and includes validation of your current control practice, monitoring for potential resistance to Bt and to confirm/reject if rootworms are responsible for lodged corn. The time to do dig roots is after peak larval feeding but before significant root regeneration occurs. Typically, late July is a good time to start. It is hard to predict when (if) roots will start to regenerate. However, I would expect a three week window before root regeneration can conceal previous feeding. Regardless of the control practice used, some feeding is likely, if not economically allowable. A general rule of thumb is if the NIS field average is less than 0.25 there should not be any economical loss. If the NIS rating was above 0.75 then economical loss is likely to occur. A rating between 0.25 and 0.75 is a gray area. Loss will be dependent on several factors which include hybrid, rainfall, compaction, fertility levels, etc. You should expect to see some injury on Bt hybrids as well. You can use the above ranges to determine yield loss, however, your first concern will probably be resistance. Resistance should be considered if the field average is > 1.0 on single gene hybrid or > 0.5 on pyramid (two Bt crw proteins). Remember to avoid structured refuges and if a RIB is planted that 5-10% of the plants do not contain the Bt protein(s). If resistance is suspected, contact your seed sales person. They know the steps to take and are obligated to respond. 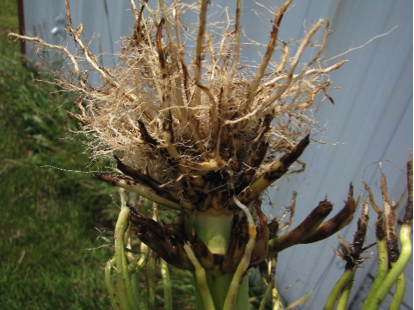 If you are responding to a lodged corn complaint, do not assume rootworms are the cause. They may or they may not. Or, they could be a contributing factor. Respond to the complaint as soon as possible and familiarize yourself w/ weather events from that area. Tall corn, especially with a developing ear, may easily lodge in areas exposed to wind, rain, etc. Routinely monitoring roots in first year corn fields can alleviate concerns you might have regarding “rotation resistant” rootworms. 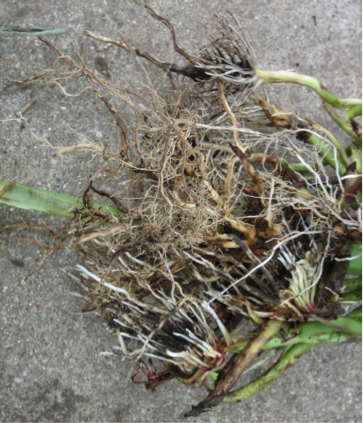 Western corn rootworms have adapted to a corn/bean rotation by laying eggs in soybean fields. This phenomenon has been confined to selected areas of the Midwest, including southeast WI. However, recent complaints have been very infrequent. Northern corn rootworms have adapted to a corn/bean rotation because a percentage of their population requires 2 winter chill period before eggs hatch. This has not been confirmed in Wisconsin but may happen on rare occasions.